St. Patrick's Day is this Thursday and other than just wearing the required green, I have never done much else for it. As we came into March I began to think of why Nat and I never did St. Patty's crafts and what could we do to make up for it. So, we gathered a few nice rocks and decided to make them into our very own Kissing Blarney Stones! Before we set out to paint and decorate, I wanted to know what was a blarney stone and why do people want to kiss it. I found out that it is part of a castle in Ireland where legend has, if you kiss it, it will give you the gift of gab (like Nat and I need more of that)! There is never a stone that whoever kisses, Oh! He never misses to grow eloquent 'tis he may clamber to a lady's chamber, or become a member of parliament. 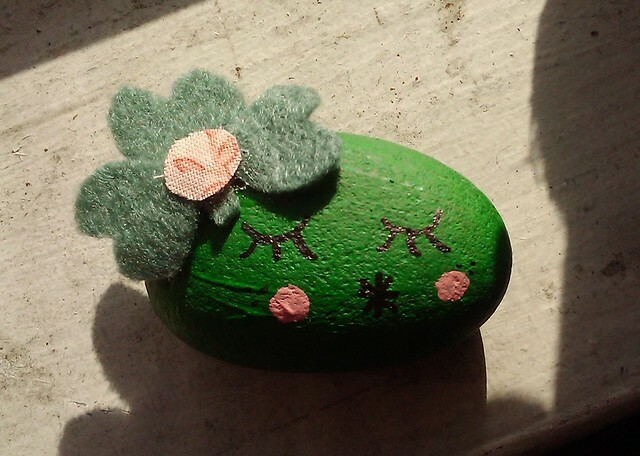 Nat and I began to paint our rocks (green, of course) and the following day I set out to make the example pair for her. I came up with Mrs Clover Blarney and Mr Seamus Blarney. I fashioned a little shamrock for the missus by gluing three light green heart shapes cut from felt topped with a patterned cloth circle. Seamus has a hat made from a rectangular piece of felt glued onto a circular base and two yellow strips by the brim. I used a hot glue gun for all the pieces and for attaching it onto his little green head. Of course, with better (and more patient) skills than mine, you can make it where you don't see the glue or better yet, sew it all together. I gave Seamus a 'beard' of yarn, frayed a bit on the edges. Both the Mister and the Missus have their eyes closed and their lips puckered as an asterisk ready for a smooch! Since Mr Seamus was a more glossy stone than Mrs Clover, his green appeared darker and was harder to see his expression. I went over the black permanent marker with yellow paint thinking you might see his face more but I think it ended up adding to the confusion. I went back with the marker but left him with bright yellow freckles anyway! Also, since I didn't give his hat a top, I just filled it with a paper shamrock. We still have her stones to do and hopefully they will all be up and ready for smooching by thursday! That's found near the banks of Killarney? Once she hears the sweet sound of the Blarney. There's a stone that contains all this Blarney. You may kiss whom you plaze, with your Blarney. Since we never did crafts before for this holiday, I did want to read up about it a bit. I found out that St. Patrick was a Missionary who is credited for bringing Christianity to the masses. Now, we are always associating the shamrock with this holiday and with Ireland itself but why is it used? I found out that St. Patrick used the shamrock to explain the Holy Trinity to the people. I also wanted to know what the difference between a shamrock and a clover is and found out that that there is none, really for the shamrock is just the name of three leafed old white clover. The name shamrock is derived from the Irish seamróg (little clover) which is the diminutive version of the Irish word for clover, (seamair). I think that's pretty neat and now have a whole new and appreciative outlook on the plant and the holiday itself. I love the little puckered lips on your rocks. Too, cute!